I was fascinated with an Instapundit post about Hillary Clinton and autofill. In the Instapundit screenshot the search terms “hillary clinton indictment” appeared before “hillary clinton”. Although autofill(autocomplete) primarily uses your web browser cache to offer suggestions, it also looks at what people in your region have been searching for. In the post the author was using the Bing search engine so I was curious what Bing and other search engines would show for me. Here is my Bing and Google search screenshots. 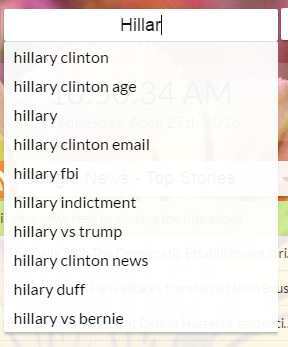 The three most interesting search terms for me was “hillary clinton email”, “hillary indictment”, and “hillary fbi” since I was pretty sure I had never used those search terms. So I went over to Google Trends to see why the search engines are including those search terms. From this Google Trends chart we can conclude that the public has significantly increased their interest in fact checking Ms. Clinton and the media’s version of the story. To put the significance of this chart in perspective I created one more chart to show the relative size of searches versus a generic search for “hillary clinton”. 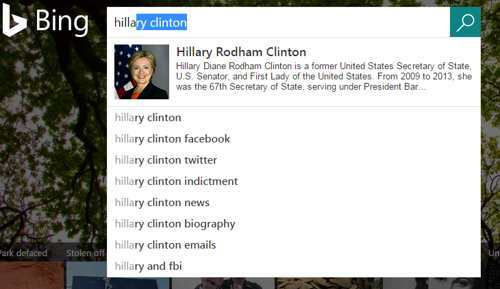 We can see that although there has been significant increase of interest in Ms. Clinton’s legal problems, it is a relatively small portion of the searches for “hillary clinton”. ← Is The BioSolar Battery The Game Changer?